Our newest 88" Kinetic Orbit Stake Wind Spinner is one of cleanest yet most popular designs! 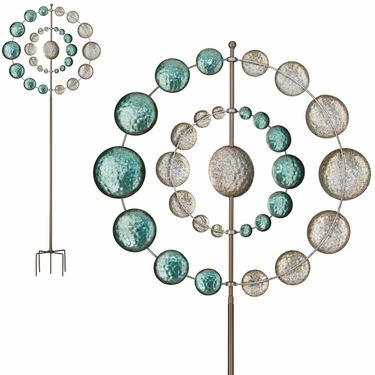 Waxing and Waning in design like a moon in orbit, this simple kinetic orbiter will bring your garden and patio a sense of wonder and illusion! Two independent arms with circular wind cups harness the wind, sending them into their own horizontal orbits around a center moon. Heavy duty quality bearings provide smooth, fast twirling action. Weather resistant powder-coat resists the elements for year-round use. Precision bearings for smooth twirling action. Simple and classic motion design.